"The idea that someone didn't like it, didn't really phase me." Hulu has premiered the trailer for the new feature-length documentary titled Obey Giant: The Art & Dissent of Shepard Fairey, which will be available on Hulu starting this weekend. 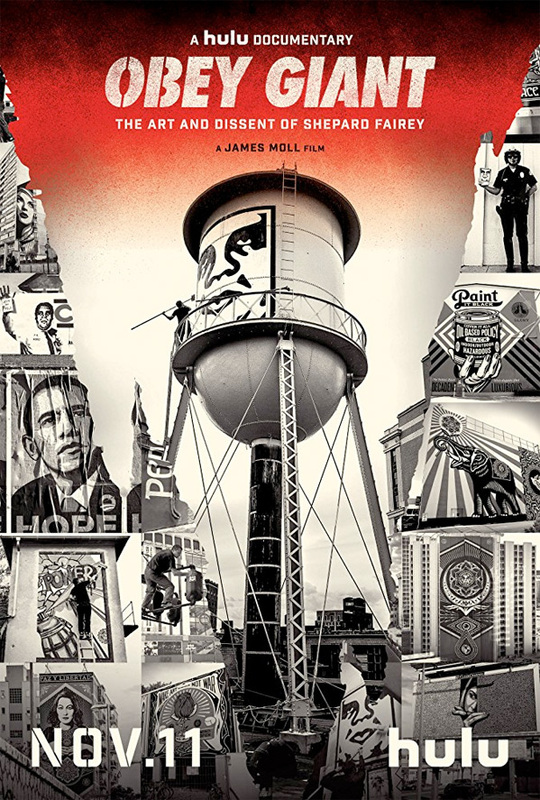 Made by Oscar-winning documentarian James Moll, the film profiles the life and work of artist Shepard Fairey, following his roots in punk rock and skateboarding to his creation of the iconic Obama HOPE poster and the controversy that surrounds it. We're big fans of street art and the artists behind controversial street art, including Banksy (including his two docs Exit Through the Gift Shop and Banksy Does New York) and many others. Fairey is also a prominent, well-respected artist and this seems like a fascinating, exciting look at his life and all of his work. I really want to watch this doc. Obey Giant takes us deep into the underground world of street art, profiling the rise of artist Shepard Fairey from his roots in punk rock and skateboarding, to presidential politics -- through his iconic Obama "HOPE" poster and the controversy that surrounded it. Obey Giant: The Art & Dissent of Shepard Fairey is directed by Oscar-winning documentary filmmaker James Moll, of the docs The Last Days, Price for Peace, Inheritance, Running the Sahara, Foo Fighters: Back and Forth, and Farmland previously. This hasn't premiered at any film festivals before. Hulu will release Moll's Obey Giant: The Art & Dissent of Shepard Fairey doc streaming exclusively starting on November 11th this month. Who's interested in it?